Mercury free, fluoride releasing, silver restorative. Proprietary ionglass technology. Riva Silver utilises SDI’s proprietary ionglass™ filler developed by our glass technologists. ionglass™ is a radiopaque, high ion releasing, reactive glass used in SDI’s range of dental cements. 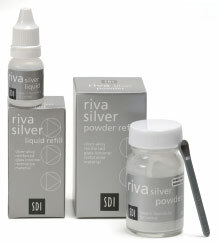 Riva Silver releases substantially higher fluoride to assist with remineralisation of the natural dentition. The light grey colour of Riva Silver requires minimal masking when used under aesthetic restorations.